In the digital age like today, the idea of losing a wallet or an important card like your Social Security card in your wallet might seem like a low risk, or even without risk at all. But there are people who suffer because the wallet is lost or stolen all the time. And feeling that experience together with the lost Social Security card only doubles the confusion and pain that we feel. While there must be some reliable ways to avoid losing your Social Security card, such as locking it in a safe place, or keeping the card out of your wallet and pocket. But there are still many people who have lost their Social Security cards. And make no mistake, being able to get our social security card back can be a bit of a process. But don't worry, numbones.com will explain what you have to do when you lose your social security card easily. Study what documents you need to verify your nationality, age and identity. You will find a list on the official website of the Social Security Administration. Then Fill in and print the Social Security card application. Bring or send documents and applications to the Social Security Administration. To find the nearest Social Security Administration office, use the online agency office tracking tool or you can search through Google Maps. Now that you know the basics of the easy steps we have to take when we lose our social security card, let's learn more about what to do if you lose your Social Security card. And certainly, fast action is important. Devin Carroll, founder of Social Security Intelligence, said that if someone loses their Social Security card, the first thing they have to do is make sure they have claimed their 'SSA' profile on the Social Security website, in the 'My Account' section. Devin Caroll also said that you can not only ask for a replacement card, but you can also quickly check the accuracy of your annual income history, print a benefit report and change your address. When you contact the Social Security Administration to report, and apply for a lost card, you should know that the agency has a list of "things to do" that need to be completed before they accept your request to get a new social security card. And for your information, if the Social Security card is missing, the Social Security Administration (SSA) provides, free of charge, three card replacements each year, and 10 free cards during your lifetime. You must be a US citizen aged 18 years or more with a U.S. postal address. You do not request a change of name or other changes to your new social security card. Those documents that we mentioned above are important documents. Like a driver's license, birth certificate, especially a passport. Do not let you lose those document, because if you lost your passport, stolen passport, lost your driver's license, or lost your birth certificate, then it could be quite difficult to replace it. Because you have to process like making a new birth certificate. But there are some exceptions if you can't get the identification documents that are needed, or don't have them at all. SSA can also accept other ss 5 form of identification that show your legal name and biographical data. Acceptable options include I.D. U.S. military cards, Naturalization certificates, employee identity cards, certified copies of medical records (where they are usually obtained from clinics, doctors or hospitals), health insurance cards, Medicaid cards, or school identity cards. You must note that any identification documents listed above must be original documents or copies certified by the issuing agent. Because SSA will not accept photo copy IDs, or copied documents that are notarized. Any receipt that proves that you are applying for a valid form of identification will not be accepted. After you have the right credentials, simply fill in the replacement card form that can be downloaded on the official SSA website. Make sure your document has been signed and dated, then print the completed form and bring it or send the document to the local Social Security office. You can also find local offices around you on the SSA website. After your application is complete, and your information has been verified, SSA will immediately send your replacement social security card office to your home address. And you should hope your replacement card has the exact same full name and Social Security number lookup that is the same as your old card. The Social Security Number (SSN) has nine digits, can be either letters or numbers. And it is usually written as three fields separated by hyphens. Examples of social security numbers like “AAA-GG-SSSS”. After you receive your new social security card, this time make sure to keep it in a safe place until you really need it. Experts advise these social security card holders not to carry this card at any time, partly because you risk losing again, and in part because you really don't need to carry a social security card around regularly. In fact, a Social Security expert said that Social Security cards are not relevant in the digital age, and the real priority must be targeted at fraud protection. Steven J.J. Weisman, Esq., A college professor based in Amherst, Massachusetts whose expertise in investigating white-collar crime states that it is very rare that you need your actual Social Security card. In fact, he said that the Social Security Number is the most important part of the information that criminals can use to make you a victim of identity theft, because this kind of crime makes you not have to carry a social security card with you in your wallet. But if your social security card is lost, Weisman strongly recommends taking direct action to protect cardholders from financial fraud. Weisman also said that "Because there will be a lot of danger of identity theft if your Social Security card is lost, you must immediately freeze credit on your credit report in each of the three major credit reporting agencies to prevent someone from using your Social Security number for everything which can harm you ". Data security experts from other parties also agree to this, citing the risk of losing the card if you bring it to the wallet. Robert Siciliano, a Boston-based security industry specialist, also said that it is never a good idea to carry a Social Security card unless you are going to fill out an application that requires you to have a Social Security card with your person. In addition, he also said that it was mainly because it was a rare opportunity that we needed our Social Security card with us every day. Siciliano also suggested that if you really need to carry your Social Security card, choose a mobile approach, but with big security precautions. The point is that you can take the photo and upload it to your mobile device. Because as long as your device is password protected, your data will be fine. And to block Social Security fraud, make sure your Social Security card number does not appear on other ID cards. Such as health care insurance cards, or other insurance cards. Also, make sure your driver's license number is not the same as your Social Security number. If there is another party whether it's a bank or your credit card company that is trying to use your Social Security number as an account number, you must immediately request a new number. For your information, As the last layer of data protection with your Social Security card, you should take at least once a year to review your Social Security Income Statement for any indication of violation or fraud of Social Security. Find the statement on the "my account" page, on the official Social Security website. Once again we remind you, if you lose your Social Security card, don't wait to resolve the situation and apply for a new one. Because lost or stolen cards make you face a higher risk of fraud. 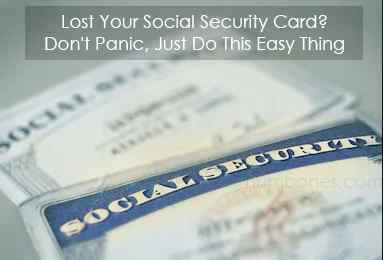 As soon as you feel that your social security card is lost, immediately do this easy thing to immediately fix this problem. And most importantly, the faster you get a new card, and keep it in a safe and secure place, the better it will be. 0 Response to "Lost Your Social Security Card? Don't Panic, Just Do This Easy Thing"